Recently, on a journey from Somerset to Rye, in Sussex (a very LONG journey, beset by a great deal of traffic, since you ask), we stopped off at Charleston Farmhouse. Charleston, tucked under the Sussex Downs, was the home of Vanessa Bell, the sister of Virginia Woolf, on-and-off from 1916; she, her sort-of partner Duncan Grant and his friend and lover David Garnett, together with her two sons by her husband Clive Bell, Julian and Quentin, and Henry the dog, moved into the house so that Duncan and Clive, who were conscientious objectors, could work on a nearby farm as a substitute for fighting. It was a rambling farmhouse which had recently been used as a boarding house. There was no running water and it was very cold. Over the years, Vanessa and Duncan, both painters, together with friends who often came down to stay, decorated the house in their own charming and very individual way. One of them designed an adaptation to the fireplaces, constructing a sort of platform of large bricks which helped to retain and reflect heat out into the rooms. Vanessa painted patterns onto the fireplace surrounds in chalky pastel colours: figures, vases of flowers, abstract patterns. She bought cheap wardrobes and decorated those too, with bold yellow circles and a border in a contrasting dark red. Basically, if it didn't move, and it wasn't made of polished wood, she or one of the others painted it - doors, shutters, bedheads - even box files! Someone else made lightshades out of colanders, the dining room walls were stencilled, and everywhere there were paintings, by Vanessa and Duncan and various friends: portraits of each other and other members of the Bloomsbury Group - including, of course, Virginia; copies - not exact: more like tributes - of classical paintings; pottery made by Quentin Bell, Vanessa's son; fabrics designed by Duncan Grant. It's a lovely house. A little shabby, but comfortable: so easy to imagine evenings by the fire with interesting conversation and ideas being bounced from one to another; summer days spent in the garden with its beds of luxuriant flowers - like the house, tended but relaxed. But the room I found the most moving was the one they call the Garden Room. This became Vanessa's bedroom in later years. As the name suggests, it has a beautiful view out into the garden. There is a narrow single bed - you can imagine Vanessa waking up in the morning, propping herself up on her pillows, gazing out at the garden, and thinking about the people she has loved and lost. Above the bed is a portrait of her son, Julian, who was killed in the Spanish Civil War in 1937. How anguished she must have been, when, after she and her friends had been so determinedly anti-war, to hear him say that he was going off to fight; and then how desolate when she heard of his death. Of course, the Bloomsbury Group are known for their tangled web of relationships. As we went round the house on a guided tour (you can't wander round on your own) there were lots of knitted brows and constant queries - "What, so she was married to him, but then...?" and "But I thought her father was...?" You do have to concentrate, especially when it comes to the bit where Angelica, Vanessa's daughter by Duncan Grant, grows up to marry David Garnett, her father's lover. It was Angelica who in 1980 helped to form the Charleston Trust, which now looks after the house. I was an early visitor when it opened to the public over thirty years ago. There were lots of articles in magazines about the house and its inhabitants, and Laura Ashley produced a range of fabrics inspired by the house. I made curtains out of some of them, and very lovely they were; and, a little like Vanessa, for quite a long spell I decorated chairs and cupboards and walls, albeit in a much simpler way - I stippled and sponged and picked out details until our poor house begged for mercy. So it was lovely to go back and see the house again. I'd hoped to buy a little something from the shop, but everything was much too expensive - a stunning lampshade was well over £100 (ironic, considering that the house was originally decorated on something of a shoestring), so I had to be satisfied with a few postcards. And my apologies for the lack of pictures in this post: photographs were not allowed, and there's a very stern warning on the website about using pictures from there without permission. But here's the link to the website, where you can see the house in all its loveliness. The last room you visit is the studio where Duncan Grant worked pretty much up to his death in 1978. It's full of the everyday detritus of an artist's life: there's his easel, his chair, and on the overflowing mantelpiece, a soda siphon, a whisky bottle and a glass. It's as if he's just left the room for a moment, perhaps to go out into the garden. A picture I took in the garden - not a very good one, I'm afraid: it was a dull and miserable day. This is very interesting, thank you, Sue. 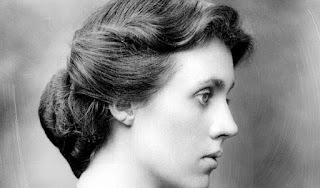 I am reading a lot about Virginia Woolf and Vanessa Bell at the moment, so your post has inspired me with another place to see! You must definitely go, Fay. There are other places too not far from there too - Rodmell House, where Virginia lived (and died) is quite close. I haven't been there. Wonderful creativity, overflowing in every direction! And what a great break to an overly-long journey.